WeWork has inked an 18-year lease to occupy the entire 20-story, 251.7k sf building at 430 California Street in San Francisco. The lease value was not disclosed. WeWork will be the sole tenant in the landmark office tower that sits adjacent to a 27k sf, historic bank branch at 400 California St in the city’s North Financial District. WeWork plans to open its first phase at 430 California Street in Q1 2019. The building is owned by Kennedy Wilson and joint-venture partner Takenaka Corporation. The lease deal, which is one of the largest office leases recorded in San Francisco this year, comes just over a year following KW and Takenaka’s acquisition of the property that, at the time, was 100% occupied by MUFG Union Bank. The joint venture engaged Gensler to lead a multi-million-dollar interior renovation and repositioning of the property as MUFG Union Bank vacates the buildings, including modernizing the lobby with an updated layout, materials and lighting while adding building-wide amenities and maintaining enough leasable area to add food and beverage retailers to the ground floor. 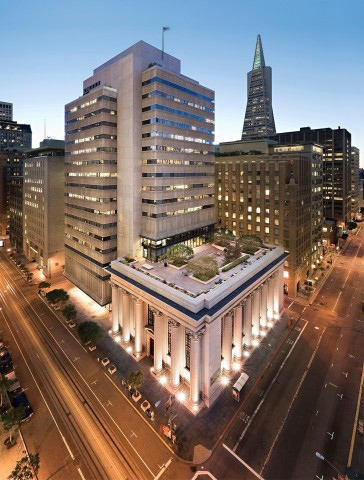 The office tower at 430 California Street provides excellent views of the San Francisco skyline, with a 10k sf deck over the roof of the adjacent bank branch and three additional exterior decks. The property is conveniently located in the heart of the Financial District with close access to the California Street cable car line, two BART stations, and within walking distance of the new Transbay Transit Center as well as the Ferry Building.